The good thing about cheap plastic pots is that you can easily turn them into great DIY gifts or into nice decor items for your home or garden. Here are few ideas on how to decoupage a flower pot and make hanging flower pot out of simple and cheap plastic pot. On your right you see the kind of cheap plastic flower pot I used for this project. It cost me $0.7 a piece. On the left you see, how it got transformed by being decoupaged. Some plastic is tricky for decoupage, as both paint and polish have hard time sticking to it. So, you have to start by working with sandpaper on the pot first. You may also put a layer of glue and let it try up well and only then start repainting the pot or decoupaging it. I put a layer of white water based paint on the pot. 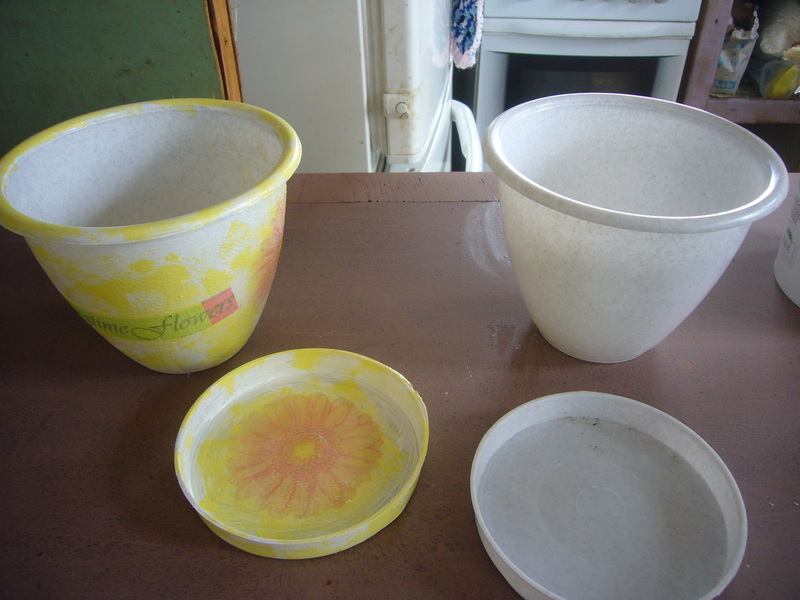 Even though it did not change the pot color, it helped the napkin pattern to stick better to it. Let the paint dry well. Cut out your napkin patterns and try to position them well on your pot. Sometimes I get so anxious to decorate that I do not do the positioning on a dry pot. It’s an easy way to let things go wrong. When you try them on a dry pot, you can always change your mind and pattern, too. I use transparent polish for my decoupage projects. I apply the polish sparingly on the pot surface. Then I glue the napkin pattern, get rid bubbles with a soft brush and only then put more polish to soak the napkin well. 5. Cover up the entire pot with the polish and let it dry well. If you just leave the napkin pattern on, the decoupaged flower pot would look like some child’s craft piece. To make it look better, you should color it. I use the same white paint as for the base. Only I add various tints and colors to it. Experiment. Place a small amount of white paint into a small bowl and start adding colors to it until you get the desired tint. Then you may apply the paint to your decoupaged flower pot with a brush, but I prefer using either plastic foam or a piece of napkin. You dip it into the paint and make gentle strokes on your pot. It adds an airy touch of color to it. Now, how do you turn a simple plastic pot like that into a hanging one? It’s pretty easy. First, I made the holes in the pot. I used a nail and pliers for this purpose. You take the nail with the pliers and heat it up. I simply stuck it into the gas stove. Once it heats up enough, you easily prick the holes in the plastic. Only make sure to use pliers with the plastic handles. The iron ones would heat up and burn your fingers. 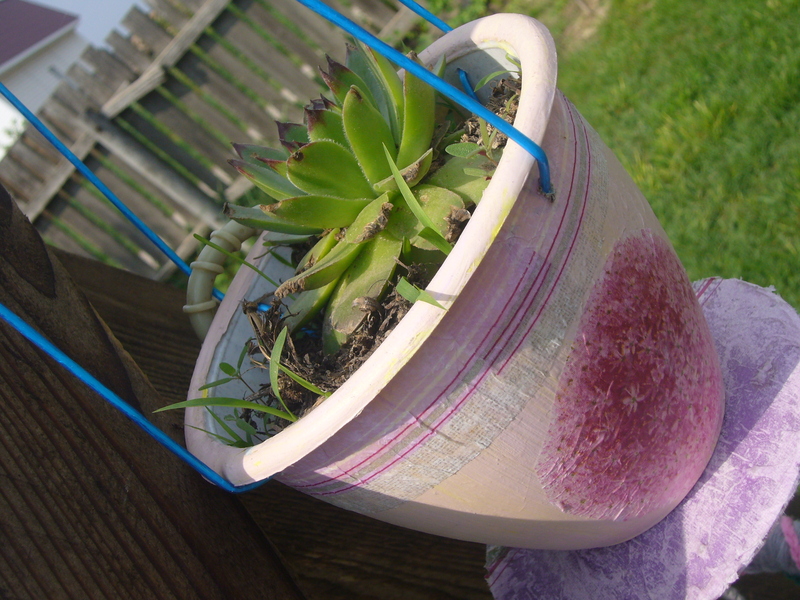 Then I decoupaged the flower pot and put the ropes thru the holes in it. I also used a decoupaged old CD as a pot holder. I have also made holes with a hot nail in it and attached it with the same blue rope to the decoupaged flower pot. That’s my step by step DIY decoupage tutorial for flower pots. I hope you find it useful. Comments are welcomed. This entry was posted in Crafting Tutorials, Decoupage ideas, Uncategorized and tagged crafts, creative tips, creativity, decoupage, decoupage how to, decoupage step by step, decoupage tutorial, design, DIY, diy gifts, diy ideas, easy crafts, easy handmade gifts, flower pot decoupage tutorial, flower pots, garden, garden decor, handmade, home and garden, home decor, home design, plastic decoupage tips. Bookmark the permalink. Reading your blog makes me want to decoupage half the things in my house! You do a beautiful job! And I now have more recipes to try (Although, my waffle maker is nothing compared to yours, lol). I’m so glad you stopped by blog (Diy Nerd) so that I could sneak behind you and follow you back to yours! I’m inspired to see what I can do too! Thank-you!